It is now 5 sleeps to VLM and I feel quite nonplussed about it. I should be more eager to do well, salvage something from this first 6 months, but I don’t. And I can’t decide if this is an advantage or not. I am looking forward to the weekend. Any big city marathon has this atmosphere, it’s a aura of anticipation, you can feel peoples apprehensions, fears and excitement. New York especially. You can hear and see this in people’s language their movement and their manner. People have said it’s a buzz and that is exactly what it is like. It overrides the constant hum of the city, that perpetual drone of traffic, activity and industry. The ‘buzz’ drowns all that out, especially if you are a competitor. The ‘buzz’ seeps into you, engulfing and encompassing. The build up to the event helps this. Reminders are everywhere you go, television adverts for live coverage, social media, training plans, nutrition plans, tapering, even road closures and special travel arrangements. You can’t get away from it, it stokes the buzz fire, it fuels the buzz fire. I am hoping that this will engulf me when I get to the Big Smoke on Saturday. So where am I with fitness? I think I am in better condition that I have been in a long time. Recovery from training sessions has reduced, surprising at my age. I know the reasons for this and I will go into it in another blog post. I know I am not in PB shape, so I have no expectations of running close to 2:30 (this time), but I think I should be able to run quicker than I did at Edinburgh last year (2:38:25). BUT, I can still feel fatigue in the legs from the G2E Ultra. It was just over two weeks ago, so what should I expect? Ian, a veteran of ultras, told me at Parkrun on Saturday, that he always feels the second week after an ultra is the worst in terms of fatigue. I have to believe him as I have no idea. The stress you put the body through must have a longer term impact on hormone levels, the adrenal gland and therefore the recovery. This might have been evident at the Parkrun. I had decided to run conservatively, push myself to half marathon effort, in terms of heart rate and it turned out to be 5:38 pace. This is good, but I couldn’t have sustained that for a half marathon and I am not sure how much faster I could have pushed, even though I was 16 beats per minute off my lab tested heart rate max. I am just too tired. Previously, where I have worn a HRM at Parkrun, the average HR for the 5K has been around 175, a full 10 beats per minute higher than Saturday’s effort. For me, 10 beats equates to around 25-30 seconds per mile. So, on that basis, I have to be pleased to think that I might be able to pull off a Parkrun, when fully rested, at around 5:08-5:13 per mile. This would seem reasonable considering the paces I have been hitting in my interval sessions prior to the G2E. A wee test may be in order once the marathon is out of the way and I have returned to a ‘normal’ level of fatigue, a level that cannot be adjusted further due to work commitments and 2 little people in the home!!! From a race tactics perspective, there are a couple of trains of thought. I could go out at a fast pace, based on what I think I could be capable of if fully recovered, hold on for as long as possible and try to avoid a death march up The Mall. My self conscious being want’s to avoid the embarrassment of running past the Queen with saliva dripping from me, dragging my sorry back side past her house as hoards of runners pass me. On the flip side, this might not happen and I set off hard and maintain the pace or slow only slightly. The alternative is to start easier than I would want and pick up the pace as I go. This seems the sensible option, but what if I start too slow and end up with a lot to do in the last 10k? Fortunately, there are a group of lads I know running around the same expected pace as me, so I should go with them, hang on for as long as I can and hope that the fatigue, that I know is coming, doesn’t appear too soon. Friggate park is about 2.5 miles from my house, probably a little shorter as the crow flies. With London Marathon next Sunday I was apprehensive of going up and having a full on blast at this organised time trial, but I thought I would go anyway. After all, it is on my doorstep (in comparison to Cramond which is 10 miles away). Louise and Stuart were staying at the hotel about a mile from my house as Stuart is running the Great Edinburgh Run on Sunday 19th and they had also decided to go along to the parkrun so it was good to see some familiar faces including them, Ian and Lorraine, Kieran, David and a few others. It was a lovely morning in Figgate Park, sunny, a light easterly breeze and cool. Ideal running conditions. I left the house in plenty of time, no breakfast, only coffee, and headed up through Brunstane to Portobello Park along to Figgate. It was busy when I got there, and very busy by the time the race started. On the way up, I was watching my heart rate as the HRV value this morning was not favourable for a hard effort even though I took yesterday as a rest day, so it was no surprise to see a heart rate of 140+ for 7:30 pace, normally that would be 6:30 pace. I knew I wasn’t firing on all cylinders and as it was, with London next week, I was happy to not push too hard anyway. At the start there was the usual H – B – T shouts from those in the shity brown vests (yawn, will they ever get as bored as we are of that – D.U.L.L, they are like sheep, baaaaaa). Anyway, David Limmer from the local club shot off like a bullet, along with a few others, I was quite happy to let them go and settled into a pace, watching my heart rate all the way. I was hoping to settle on a marathon paced heart rate but was a few beats higher than that. The parkrun is 3 laps, more yawns, and I managed to pass a few on the first half mile and ended up in third spot directly behind a young lad. He was pushing hard and I was quite happy just sitting in behind him. David, on a mission, was already 200m up ahead by the time we got to the first bridge crossing. My HR was creeping over threshold and I decided to reign it in a little and get the HR back down to a normal level. The lad in front seemed to slow in the second lap and I was just running at a sustained effort and passed him. He had other ideas though and within the next 30 metres had passed me again. A quick look at my watch showed that I had breached threshold effort again, so held back the pace and on the third lap Richard passed me looking very strong for having run the G2E with me a couple of weekends before. Great running by these guys and I was happy just sustaining my effort to the end and letting them go for it. Crossed the line as 4th finisher, first auld guy, and was actually quite happy with my effort levels and pace considering the elevated heart rate on the way up. It was also elevated on the jog back home, but that may have been due to the harder effort. So I crossed the line in 17:46 (I think my slowest park run for some time) with an average heart rate of 165 (about 91% of max and roughly half marathon effort) so I am actually quite encouraged by that. My legs still feel tired from the G2E and there was certainly not much else there today in terms of speed, but that is fine, on previous parkruns, my average HR has been at 175 or more, showing there is about 20-30 seconds per mile in there on when I am feeling a little fresher. David Limmer of Protobello Running Club had a great run to cross the line in 1st spot with a time of 16:24. given the undulations and the number of sharp turns on the course (3 times as well), I think this is a very good run from him and I am sure on a flat course he will be approaching that magical 16 minute barrier. The parkrun itself got off to a great start, very well organised and I saw no mishaps or issues. If there were any they were well hidden so a big doth of the cap to the organisers as they seem to have a wee gem of a parkrun not too far from me. The only slight issue is the 3rd lap. The guys and girls at the front will always have to navigate through those at the back of the pack, but hey, it’s a parkrun, let’s not take it too seriously!! Good jog home with Stoosh and Lou, good luck to Stoosh at tomorrows run, I am sure he will blast it. The thing about ultra marathons, is that you can’t go out and do another one a week or two later. Well, you could, but unless you are Mike Wardian, you are unlikely to run well. They are different to 10k or even half marathons, where one bad race could be rectified by a good race the following week or two, restoring lost confidence and pride!! I am not going to be able to do that for some months, it is one of the things that comes with this sport. Since the race all I have done is eat and drink!! I have been shoveling it away like I am saving up for a famine! I gain weight very easily so I will need to be very careful over the next couple of weeks to keep the weight down for London marathon. Once we leave Reay tomorrow (Wed 8th April) I will get back on track with food and I will be off booze again. I flew up to Wick on Sunday afternoon. It was a really good flight with Flybe. Check in on-line, hand luggage only. Took the train and tram to the airport and went straight through security and onto my plane. Pretty easy really. Mrs Boab and the tiny Boabs had headed north the previous Friday and as I was racing I got the later flight. Anyway, time for reflection. There have been a few days now to think over what actually happened in the race, and also a couple of comments I’ve received have got me thinking a little deeper than I initially thought. My initial thoughts were, injury struck at 36 miles, it had been building for 20 miles and came to a head with severe pain at 36 miles, slowing me to a walk. But was it an injury? This has been the question I have asked myself since Ian Beattie commented to me that he knows other ultra runners ‘who took time to get it right’. This actually had not crossed my mind. The pace was right, it was what I had been doing in training. In training I had the extra advantage of heart rate numbers, which I don’t use in races. So I was positive that the pace was well within me. This was confounded by how good my legs were feeling (minus the hip pain of course). My feet felt fresh, quads, hammies and calfs all behaving themselves. There was the chest pain, but breathing was good, I wasn’t pushing cardio wise, well you don’t in an ultra do you, unless there is a head to head for the finish line :). However, another runner has pointed out to me that fatigue can come in many guises, including severe pain that could be thought of as injury. The hip flexor pain isn’t unknown to me, I’ve had it a few times in the past, usually after a long run. It would never be really painful, more a grumble, certainly nowhere near enough pain to make me stop running and not a concern that I would need to get help for. There was also another runner who has mentioned that illness can bring on pain, even though you may feel fine, the illness, be it flu, cold, or whatever, could manifest itself as pain. The runner who told me that also had hip flexor issues. So this has got me questioning what really happened and I not so sure now. I’ve had two very easy jogs since Saturday and a very sedate pace and while I can feel the hip pain, it isn’t enough to make me want to stop. So has it been fatigue? I’ve got as series of tests to carry out, that will uproot any issues in the hip/glute/groin area. Once there is no pain there, I will get on with the tests and then take it from there. I thought I would put down in words my run up to this race. It is my target race for the first half of 2015. There is the small matter of the Virgin London Marathon on 26th April, but this is the ‘A’ race. 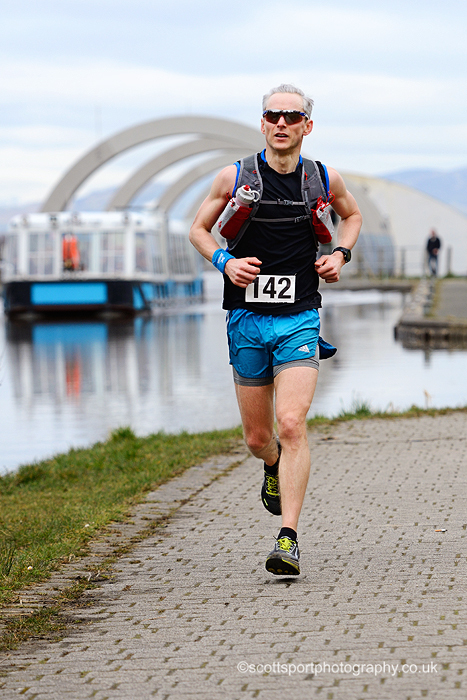 The Glasgow to Edinburgh Ultra Marathon (or the G2E) is a 55 mile ultra marathon run from Glasgow to Edinburgh on the Forth and Clyde and Union canals. It’s as flat as a pancake and follows the contours of the land from the west of Scotland to the East. It’s needless to say that my training hasn’t had much hill work in it. I’ve been working with a coach now since just after Christmas 2014, and while I was doing some hill work and off road hill running early in the plan, the specificity has kicked in over the last 12 weeks and I’ve been running on the flat. Training has gone very well, there has been a mix of speed, tempo and long running. Many of the long runs have been mixed up pace wise and I’ve found these particularly beneficial. There have also been a couple of back to back long runs over consecutive weekends along with a 4 hour 15 minute long run. I feel ready and prepared for the race. I have been surprised by how my body has responded to the amount of quality in the training plan. In recent years, this amount of quality work (at least 3 sessions a week) would have left me over trained and under recovered, leading to illness and injury. It is different this time, but I am not getting carried away, it is only 3 months of work, and there is a long way to go to build back up to where I know I should be. That is for the future. So I am ready for this race, physically. I’m also ready for this race, mentally. It will be the furthest I have run and after about 40 miles, I will be into unknown territory, but isn’t that the beauty of these events? I relish the challenge and I look forward to seeing what my body can do and more importantly, how my mind copes with the physical pain. Clothes will closely follow what I wore at the Devil O’ the Highlands race last year, but will take extra in case there is a change int he weather. It will be an early start on Saturday. The race starts at 9am, so I will be up at 5:30 making breakfast (eggs and bacon) and then on the first train out of Musselburgh. Steven will pick me up at 7:10 in Livingston and we will head to Glasgow, stopping off for a coffee on route.